Sony XDR-V1BTD review | What Hi-Fi? 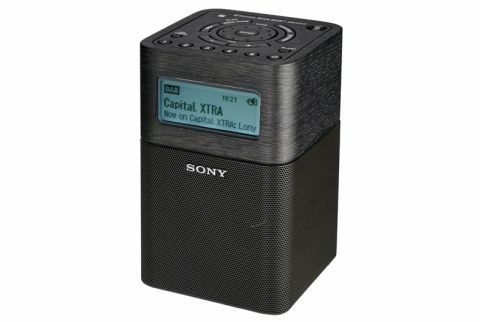 If small and portable top your radio wishlist, the Sony V1BTD ticks both boxes. Standing just 17cm tall, there aren’t many places this radio won’t squeeze into, especially when its rechargeable battery lets it go wire free for up to 25 hours. That means it’s game for the garden or a picnic in your local park, its battery pack hidden inside its slender frame with no extra bits to buy. As well as DAB and FM radio, the V1BTD packs Bluetooth and NFC, with an aux in for connecting laptops, smartphones or tablets, and a headphone out for private listening. All the controls are found on the top of the unit (there’s no remote in the box), and considering the rest of the radio looks stylish and well considered, the plasticky finish here is a bit of a let down. They’re clear and easy to use though, but the lack of pause and rewind controls for DAB is a bit of a shame. The display on the front is large enough to be readable and useful – there’s also a handy dimming button for knocking it down a few notches at night. A search for DAB stations is completed quickly, and playback of both DAB and FM stations is clear and stable, with five presets available for both. There’s an extendable aerial tucked away on the back should you need to use it to improve your signal, but given this radio’s portability, you can easily place it wherever you can get the best coverage. Sony has paid careful attention to the balance of this radio’s sound. The midrange is the star of the show here, and is slightly forward compared to everything else, which helps it to sound clear and focused. Elsewhere, the treble rarely shows any hint of brightness, even at volume, and while there’s not a whole lot of bass, what’s there is tight and well controlled. We’d rather that than a boomy attempt to give the sound more weight. It’s not the loudest radio though, and its two 45mm drivers struggle to make this radio sound any bigger than it is, even at full volume. On the plus side, its well-balanced sound means that all of the volume is usable, so you can crank it right up to the top if needed. It’ll still struggle to fill bigger rooms, but that slightly more forward midrange at least helps it to put the more important stuff front and centre – though we would like it to be a little more expressive. The small sound at play here doesn’t just affect scale – it means it struggles with dynamics too, unable to really portray the difference between loud and soft. Punchy drum kicks and handclaps don’t have any real sense of impact or bite behind them either, which all leads to a slightly flat and unexciting sound that lacks some drive. Organisation is decent though, and the Sony is able hold a tune together without getting flustered when things get tricky. This does loosen up with Bluetooth, which brings some added brightness and coarseness too. If you’re going to connect a device for playback, a wired one will give the best performance. Overall, the Sony V1BTD has quite a bit going for it, but it ultimately feels just a touch expensive for what it delivers. We love its size, portability and well-considered balance, but the small sound and poor dynamics are tricky to take at £150. You can get the Award-winning Roberts Stream 93i for that. Its flexibility, ease of use and small form may still be enough for people to opt for it at its current price, but we’d like to see it below £100 for it to be a really good purchase. Small and perfectly formed it may be, but it just falls short in its performance to really stack up.